This versatile little machine can cook up to a 35 kilo pig in the hog tray. Small enough to manage, big enough to deliver. 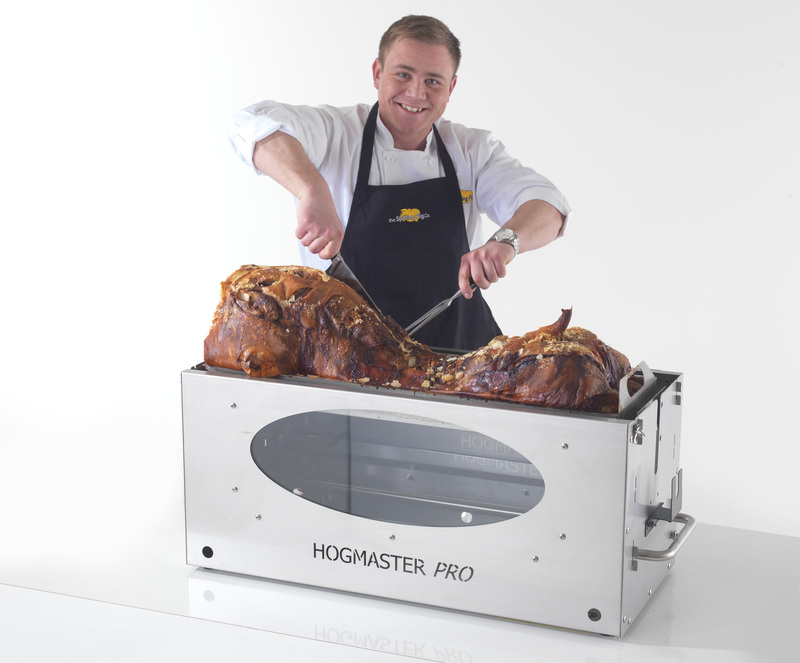 The Hogmaster Pro has become a hit particularly with hotels, pubs, restaurants and home-use, all who want to create the perfect pulled pork but on a smaller scale. The Hogmaster Pro is a great and versatile machine with a collection of accessories to go with the machine it can even turn into a mini BBQ. You can also use the BBQ to cook potatoes, side dishes etc whilst cooking your pig. It can also be used to cook delicious pizzas. All the accessories fit back into the machine for neat and tidy storage. Perfect for transporting easily due to it’s shape, size and light in weight. Your Hogmaster Pro can also be used as a spit roast machine. The motor runs on every day batteries so no need for electric cables, you can spit roast anywhere. The traditional cooking method taken to a smaller form, yet with the same amazing flavours! 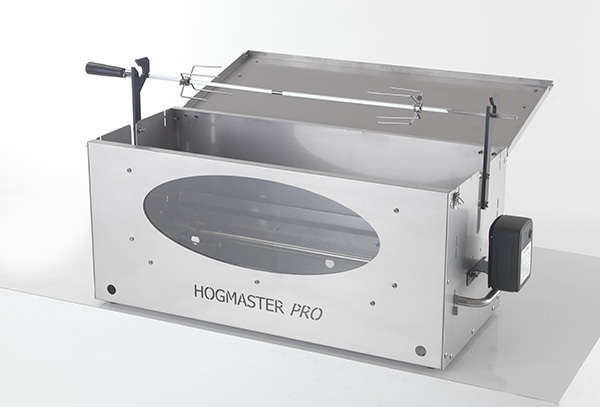 The Hogmaster Pro hog roast, spit roast and Combi roast machines come packed full of fantastic key product features. Ideal for the home and for use away in other indoor and outdoor locations, the Pro makes full use of the design features which symbolise the commercial brilliance of the larger, more commercial range of spit roaster, hog roaster and combination roasting units. The base unit itself, which is the integral structural aspect, is crafted from stainless steel for ultimate strength. The front of the machine include a panel through which clients and machine users alike can marvel at the roasting hog inside. This is achieved through incorporating a piece of glass into the base. For ease of use and mobility, there are two ultra-sturdy handles and rubber feet. The auto lighting and pilot lighting operating systems are fully automatic along with the gas assembly. The Hog set of the Pro machine comes with one catering grade stainless steel hog tray and two support bars made from stainless steel also. The spit Set utilizes the lid as a carving tray made from stainless steel, a 12 volt motor complete with bracket and a pole with spit attachments. 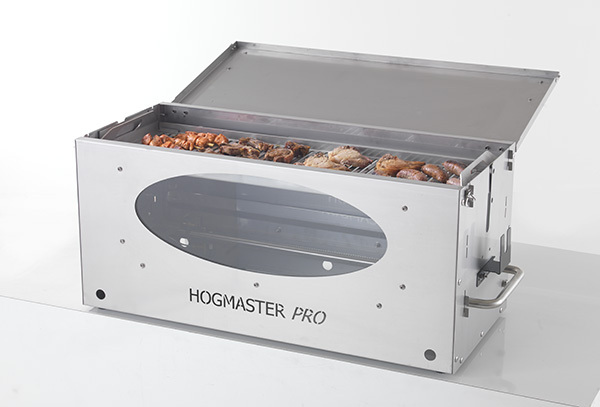 The Pro range of Hogmaster hog roast machines are great for home use, pub beer gardens, restaurant terraces etc. 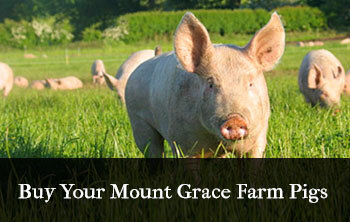 or as an addition to your commercial range for alternative meat choices to accompany a pig. They are smaller and lighter than the commercial machines and very easy to transport or move around. They have all the same features of the larger machines but on a smaller scale, they can spit roast pigs, chickens, beef etc., they can be a barbecue and they can hog roast. They are made from stainless steel and have lots of the same features as the commercial machine making them a great little piece of equipment that will last for years and years. They have a rain cover accessory so that you can keep them clean and dry when not in use. They are great for the hire market for customers having a smaller party but who still want to have a whole pig or lamb for the theatre but do not need such a large pig or machine in their garden or venue. They are very efficient and do not use very much gas the motor is 12 volt. As an alternative for the traditional home bbq they really do open up a whole new world of catering opportunities and allow you to really impress your family friends and customers without the same effort or cost as using commercial size equipment. These really are the best little bbq – spit roast – hog roast – chicken spit around. The Pro hog roast, spit-roast and ‘Combi’ constitutes the best way to enter the world of the expert barbecue. Being an essentially scaled down clone of the larger, more commercial hog roasting machines in our range, the Pro utilises ultra-tough stainless steel in the vast majority of its construction. Not only providing the machine with optimum strength and durability, the brushed stainless steel equips the professional machine with a beautiful aesthetic package that is the perfect accompaniment to any catering scenario. Whilst being unable to tackle the larger pigs, the professional machine can still pack a mighty punch in the form of its catering prowess. Being able to barbecue, spit and hog roast allows the user to cook a variety of meats simultaneously. The fact that the machine is smaller makes the Pro even more versatile as regards transport, as the machine itself is incredibly light considering its capabilities and its durability. Needing much less energy to operate, these machines really do reveal a whole new platform to catering. Utilising 12 volts motor applications, the machine is incredibly cheap to run. Fitting in with our early history, it has always been of the highest importance that we cater for the widest range of people possible. The Pro hog, spit or ‘Combi’ roaster underlines this commitment. Benefiting from all the advancements we make within our catering facet of our trade, the machine has been honed and refined over a number of years. Passing easily the CE marking requirements, the Pro adheres to the same strict regulations that we stipulate as absolutely necessary for our commercial machines at the very top of our extensive range. Making full use of up to the minute seam-sealed bonding within the stainless steel structure ensures that this machine will work smoothly, and keep on working year after year. Having streamlined our manufacturing process further, it has now never been easier for our customers to come and have a look at our products before the commit to the purchase. So if you’re looking at raising the bar of your catering prowess, look no further. 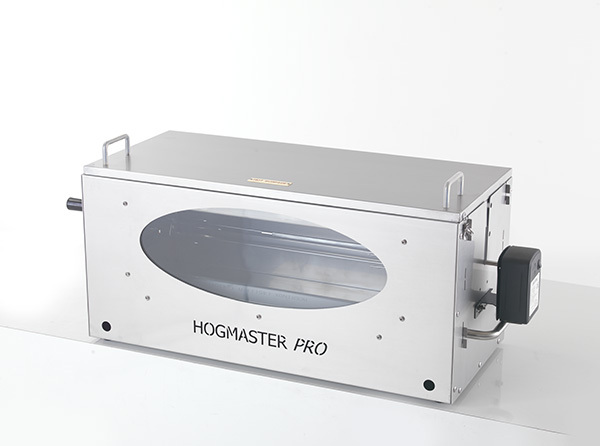 DOES THE HOGMASTER PRO SHARE ANY OF THE QUALITY OF THE COMMERCIAL MACHINES? The design and manufacture process that Spitting Pig utilises in its own manufacturing plant allows us to keep ourselves at the forefront in numerous ways. Through the commercial avenue, our hog roasters, spit roasting machines and combination roaster units all benefit from having the ability to become continually improved at our very own hog roast catered events. Due to our semi-mass productive techniques as regards the design and construction of our machines we are able to quickly, easily and seamlessly incorporate the designs of one machine into another model. Through these easily managed relationships, our machines all benefit from the experience based improvements that we make. With the Professional model, the materials used in the Titan, Hogmaster and Olympian are incorporated into the frame. This fantastic and aesthetically charming combination of materials and their respective colours makes the Pro not just the most competent small hog and spit roaster on the market today, but also one of the finest machines we have ever built. Due to the machine being smaller, in order to happily suit garden deckings and patios, the design and construction of the machine presented our engineers with certain challenges., always up for a challenge, the most high tech laser inspired solutions were used to make, in effect, a scaled down version of our commercial machine. Keeping the vast majority of the features found upon a Hogmaster spit roast and hog roast machine, the Professional may be a tad smaller, but it still packs a very powerful in the world of hog roast catering. The main body technology is inspired by the Hogmaster also, which allows the lightweight body to be coupled to a highly maneuverable system of strength and precision. With clean burners found within the Hogmaster also, the Pro is great for indoor and outdoor use, which is a great feature for the good old United Kingdom. WHAT ARE THE DIFFERENCES BETWEEN THE SPIT ROAST, COMBINATION ROAST AND HOG ROASTING UNITS AS REGARDS THE HOGMASTER PRO MACHINE? In our world of supreme hog roasting and precise spit roasting, there is no wrong way to cook a pig. Instead there are varying degrees of getting it right, and within this spectrum lies the opportunity for you, as a caterer, to be either good or simply superb. The hog roast option is the cheaper variant of the three. As far as the preparation and the cooking of a pig, it is by far the most simple and straightforward method available within the trade. It centers around the pig not turning, as the machine effectively becomes a giant oven, within which floats the pig, cooking and roasting beautifully. Simultaneously, you may choose to roast some vegetables in order to really make the most of the culinary power that resides at your fingertips if you are the owner of one of these machines. Really emphasising and highlighting the way in which our Professional machine allows you to cook for large numbers of people in any location you choose, the hog roast variant of the roaster unit requires no electricity, as there is no motor required through the lack of the turning element. A great, simple and highly effective way of cooking great food, anywhere, anytime and with the ease of use that only the Hogmaster Pro gives. The spit roast variant of the machine contains a rotating aspect via an electric motor. A real theatrical showcase, the Professional spit roaster will make you the envy of all your friends as you light up any barbecue situation with the graceful excellence. Keeping any creature rotating and basting in its own juices, the Professional spit can spit roast small and average sized pigs with consummate ease, whilst keeping the flesh sweetly basted. Needing electricity to supply the motor, the spit roaster is marginally compromised on the topic of ‘go anywhere-cook anything,’ however, it more than makes up for this in the field of fantastic and rustic theatrical food preparation. CAN I USE MY HOGMASTER PRO MACHINE IN MY SMALL SCALE CATERING BUSINESS? The Hogmaster Pro machine is a scale model of the commercial units, sharing nearly the exact same features just on a scaled down aspect. The bodywork and integral parts are made from toughened and coated steels which means that the Professional can handle light to medium weight catering with absolute ease. For the lone, mobile caterer there are few culinary tools that are any way nearly as effective. 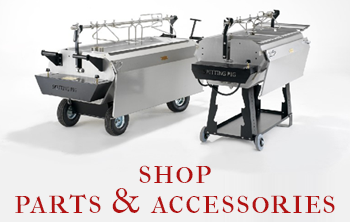 Due to being smaller than the larger, commercially intensive hog and spit roasting units, the Professional is much lighter and through this, is even more lightweight than its older brothers in the broad range we offer to the public and caterers alike. Thus, maneuverability and ease of handling are aspects that are drastically increases, making it the caterers dream. Available as a hog roast, spit roast or combination roast system, the versatility as regards the types of meat it can cook, the amount it can cater for as well as the vegetables which can be roasted inside it make this machine a true hero of the semi-intensive caterer. Popular with caterers in the UK and beyond, this machine is fast becoming one of our most well-known precision engineered products. And for all the right reasons.